You might already know that my cancer is ROS1-positive. This means my tumor cells test positive for a rearrangement of the ROS1 gene in my DNA. Now we ROS1-positive patients can help researchers learn more about our cancer by taking a survey. If you’re already sold, click on the link at the bottom of this page. For more info, read on! All human cells have the ROS1 gene, but in adult humans the ROS1 gene isn’t very active. However, sometimes the ROS1 gene fuses with another gene and becomes “rearranged.” Cells that have certain ROS1 rearrangements become cancerous. ROS1 cancer is rare – about 1% of non-small cell lung cancers – and is found in several types of cancer such as brain cancer (glioblastomas), angiosarcoma, and melanoma. 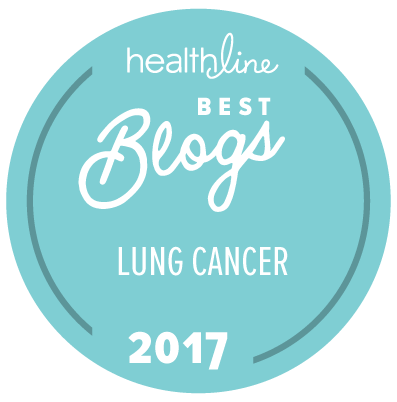 ROS1 cancer can be very aggressive, but many patients respond amazingly well to a drug called crizotinib, which is FDA approved for ROS1-positive lung cancer. You can learn more about ROS1 cancer, some of the patients who have it, and available treatments and clinical trials on the ROS1 portal . Over 100 patients who have ROS1-positive cancer of any type (regardless of where the cancer started) have joined a Facebook group called “ROS1 Positive (ROS1+) Cancer.” We hail from a dozen different countries. We discuss how to handle side effects of treatment, explore the treatments and clinical trials available to us, and post new research findings. And we share concerns about our futures, because … well, those of us with metastatic ROS1-positive cancer are not curable. I’ve had no evidence of disease (meaning we can’t detect any cancer) on crizotinib since January 2013. I wish I could say I’m cancer free, but I can’t. For most everyone who takes crizotinib, the cancer eventually develops resistance to the drug, and tumors start growing again. We ROS1ers need researchers to learn more about our cancer, and find more effective treatments. Now we can do something to help. 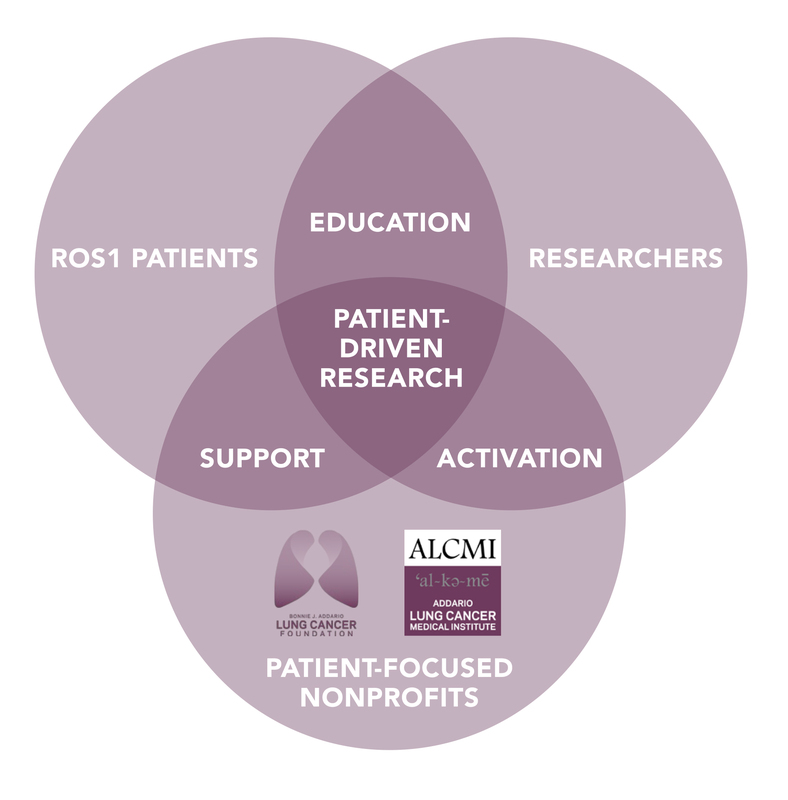 The Bonnie J. Addario Lung Cancer Foundation has partnered with ROS1ers to inform more people about our disease and develop patient-driven research that will hopefully find more effective treatments for us. Although the ALCF focuses on lung cancer, this effort is addressing ROS1-positive cancer regardless of where in the body the cancer began. The first step is an online survey that aims to discover what we ROS1ers might have in common and hopefully identify some causes for this rare cancer (the majority of the patients are young, fit never smokers). To our knowledge, this is the first-ever research into the possible causes of a genomically-driven cancer across cancer types. Please complete your survey ASAP! While the survey will remain open for a long time, the first round of data analysis will commence on July 15, 2016, with a goal of announcing preliminary findings at the World Conference on Lung Cancer in December 2016. If you have ROS1-positive cancer, please complete this survey. If someone you know has it, please encourage them to complete this survey. This entry was posted in Lung Cancer, Patient Advocacy, Precision Medicine, Research, Science, The Bright Side. Bookmark the permalink.